King Leo Promotions is gearing up for their 2nd annual Riddim Runway, Reggae Festival and Fashion Showcase on Saturday, September 19th and Sunday, September 20th in downtown Ft. Myers starting at 3 pm. Riddim Runway is a fusion of live Caribbean music and fashion and was created by King Leo Promotions as a way of giving back/giving thanks by providing support to children’s charities. Each year, profits from Riddim Runway are allocated to children charities both in the US and the Caribbean. The beneficiaries of this year’s show will be Darlene & Friends locally and L.O.A.F. (Love Over All Foundation) in Jamaica. We are proud to announce that we have teamed up with Hotel Indigo to bring this festival to beautiful downtown Fort Myers. Live music, vendors and designers will be displayed on Broadway between First and Main (Broadway will be shut down for the event). The fashion show will be held inside Hotel Indigo and there will be children’s activities in the courtyard of the hotel. Each year we strive to bring the best musical talent and we’re excited about bringing Kymani Marley along with Ky-Enie, Keisha Martin and Kehv. Featured designers this year include R. Milton, Cooyah and Eye Collection. “It’s great to see the community coming together to enjoy music, culture and fashion and at the same time helping our future generations both here and in native West-Indian Countries”, says Stacy Lee-Williams, VP of Marketing for King Leo Promotions who celebrates her birthday each year with this annual non-profit event. 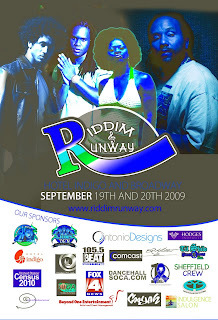 Tickets are $10 on Saturday, $20 on Sunday or $25 if bought together in advance and are available online at http://www.riddimrunway.com/ or at Hotel Indigo, 2115 Main St (239) 332-0070, Lion’s Den, 3559 Fowler Street (239) 275-3095, Indulgence Salon, 12377 S Cleveland Ave # 4 (239) 939-1009, Island Blessing 1325 Del Prado Blvd, CC (239) 573-1977. Children under 10 admitted free. No coolers, please. Parking is at the nearby City Parking Garage. Casting calls for models are being held now through September 11, 2009 at the Lion’s Den Restaurant on Fowler call (239) 275-3095 for the casting call schedule. For more info on sponsorship & vendor opportunities, media interviews and general event info, please call: Stacy Williams at (239) 462-4044. Visit our website at http://www.riddimrunway.com/ to see photos of our last show. Love Over All (http://www.loveoverall.org/) was created by Ky-Mani Marley to enable the educational development of youth by developing programs and distribution of grants that help promote positive change in low socioeconomic communities. Darlene & Friends/City’s Best in Talent showcases and awards the City’s Best in Education, Performing Arts and sports, creating a positive relationship with youth in the community.